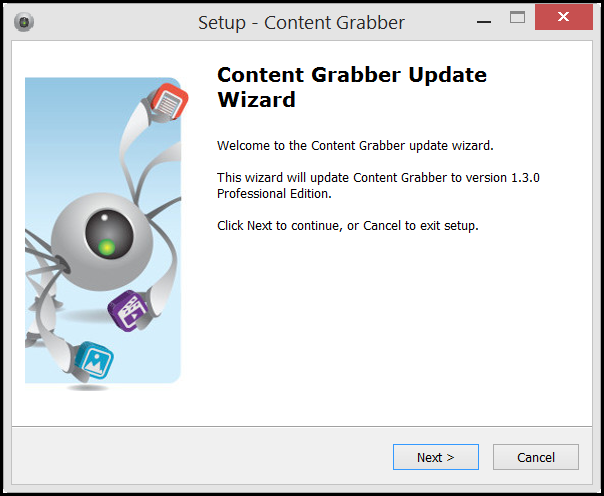 Content Grabber is a Windows-based software application. Windows 7, Windows 8, Windows 10, Windows 2008 R2, Windows 2012 and Windows 2012R2 are the supported versions of Windows. While a Macintosh version is not available, a number of our users utilize Parallel's windows emulation software to successfully run Content Grabber. 1.Download the setup file from the Content Grabber website. 2.Find the setup.zip file on your local disk (likely to be your Downloads folder). 3.Open the zip file and then double-click the setup.exe file to launch it. 4.After a moment, you'll see the first panel of the Content Grabber setup wizard. Click the Next button to continue with the installation. 5.Click the option to Accept the Agreement, and then click the Next button. 6.In the next panel, you can change the installation location. If you accept the default location, simply click Next. Otherwise, click the Browse button to choose a different installation folder, and then choose the folder and click the Open button to close the pop-up, and then click the Next button. 7.In the next panel you can change the name of the folder that will appear in the Windows Start Menu. Click Next and, in the next panel, click the Install button to complete the installation. 8.Locate the Content Grabber item in the Windows Start Menu and then launch it. Flash is disabled in Content Grabber by default, and we recommend you keep it that way unless you have a specific need to run Flash. If a website interacts with a Flash component and is unable to display correctly without Flash, then you may need to install Flash, but that would be a very rare scenario. To install Flash you must download the NAPI Flash player from the Adobe website. After installing the NAPI Flash player, you must enable Flash in Content Grabber. You can do that from the Application menu by clicking Advanced Settings and then set the option Enable Flash to true. You will need to restart Content Grabber before this change takes effect.